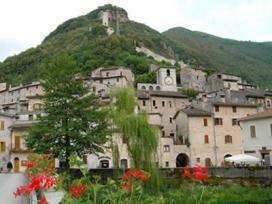 Scheggino is a small town with less than 1000 habitants situated in the valley of the Nera river. Its history is very similar to that of other towns in the Valnerina region. An important historical event was the longest siege which this small town had to endure: under Picozzo Brancaleoni in 1522. It was however, not successful because of the castle and the mighty towers which at the time completely surrounded the town. Nowadays the town can boast a truly unique contryside because of the particular beauty of the Nera valley in this area. The splendid Springs of Valcasana which are to be found in the town's vicinity are just one example of the spectacles which Nature has to offer here. The tourist who takes himself to Scheggino will be delighted by the colours and smells of Nature, which offers traffles of refined quality and river trout of genuine taste. The church of St. Nicholas which you'll find right in the middle of the town center, dates back to the 13th century, but has been entirely restored during the course of the 16th century. In the inside, at the height of the apsis, valuable frescoes are to be found. They have been attributed to the painter Spagna, who was very active in this region during a large part of his life. The church of St. Felicita, dating back to the Romanic period, will astonish you because of its primitive style; because of this, it had erroneously been attributed to the longobard period..